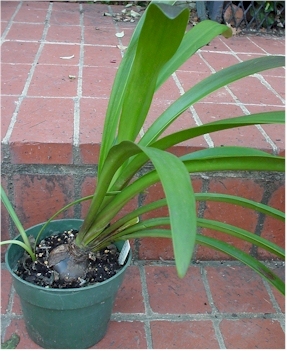 Healthy green foliage is necessary for bulb to build food stores for next year's flowers. put your plants outside on a balcony, or in a front yard, that receives direct sunlight from spring through fall. -take your amaryllis plants to the office, but only if you have the necessary sunny exposure at your office window. -see if your friends with sunny backyards are willing to "host" your Amaryllis during the growing season-you may have to promise them a flowering amaryllis to enjoy in exchange. TEMPERATURE: Amaryllis bulbs are hardy in USDA zones 9 through 11, though apparently they will do fine with mulching in the ground even in Zone 7b. In all other regions treat them as houseplants. Basically temperatures of about 75° when they are actively growing are best. Mine are routinely, are exposed to temperatures in the high 80s during the summer-I just make sure that they are kept slightly shady and well watered during very hot periods. WATER: Water as needed to keep the potting mix moist (but not soggy) at all times while the plant is actively growing. Warm, dry, sunny conditions which will require frequent watering. FERTILIZER: You must regularly fertilize your amaryllis at this stage if you want to ensure that they bloom with the maximum number of blooms/per stem and get more than one stem! Use a houseplant fertilizer that is formulated for flowering plants. If you use one for foliage plants you will get foliage but not as many blooms. If you are not good at fertilizing regularly, then use a timed-release pellet fertilizer that is mixed into the top inch of potting mix at the beginning of the growing season.